It's launch party season over here at STC Craft! 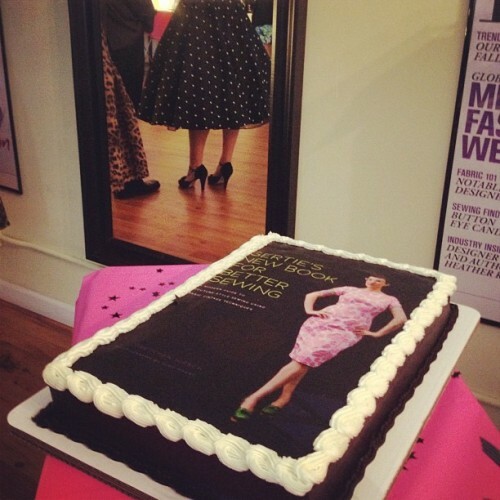 To kick things off, last Saturday we celebrated the release of Gertie's New Book for Better Sewing. The party was held at The Sewing Studio in Chelsea, and what else would you expect author Gretchen Hirsch to wear than the epic Strapless Party Dress from her book? Just look at the glamourous way the dress poofed up around Gretchen as she enjoyed a well-deserved piece of cake! Of course, other finished garments from the book were on hand for our viewing pleasure (on dress forms--not all on Gertie), and it was quite a treat to get to see the garments in person. I loved being able to look at them inside and out and see the fine craftsmanship. Those bound buttonholes are a sight to behold! And this perfectly tied bow-tie was rather impressive, as well. Over the course of the night, Gretchen signed books by the moody lights of the sewing machines scattered about the studio, and there was a general feeling of revelry in the air. Thanks so much to all of the companies who came together to throw such a wonderful party: The Sewing Studio, Kollabora, Creative Bug, and Coats and Clark. A great time was had by all! And we couldn't be prouder to see this book go out into the world and into the hands of so many fabulous sewists. To see more photos of this super-fun launch party, be sure to check out this post from Kollabora, and this post on the Creative Bug blog. Next up...all of us at STC Craft will be picking out our party dresses for the Heather Ross Prints launch party this weekend. I wish I had time to make myself a Strapless Party Dress like Gretchen's!